Jody McGlothlin on Somethintobelievein. Ted Petit Photography. Jody McGlothlin, a first go-round leader with 219 points on Somethingtobelievein, scored 218.5 in the second go-round to claim the top cumulative score and to lead 26 qualifiers, with 432 points or higher, to the NCHA Kit Kat Sugar Super Stakes Non-Pro Classic Finals on Thursday, April 11. Cody Hedlund, the first go-round winner, with 220 points on Teles One Time, scored 217 in the second round to tally 437 points, while Paul Wood, on Cool N Hot, and Bonnie Martin, on Reysin Kittens, tied with 436 points, the third-highest cumulative score. Wood also won the second go-round with 221 points. McGlothlin, the NCHA earner of $222,070, won the 2016 NCHA Futurity Non-Pro Limited on Somethingtobelievein, a Hydrive Cat daughter with career earnings of $214,348. Cody Hedlund, an NCHA Non-Pro Hall of Fame earner of $932,861, most recently showed 5-year-old Teles One Time LTE $62,309, by One Time Royalty, to win the 2019 Ike Hamilton Futurity Classic. Paula Wood, the NCHA Non-Pro Hall of Fame earner of $2,454,562, was a finalist last year in the NCHA Super Stakes Non-Pro on Cool N Hot LTE $310,972, just days after the Hottish son won the Open Super Stakes with Kobie Wood, Paula’s husband. Paula won the 2014 NCHA Super Stakes Classic riding Cool N Hot’s half-sister, Donas Suen Boon LTE $425,911, who had also carried her to win the 2012 NCHA Non-Pro Futurity. 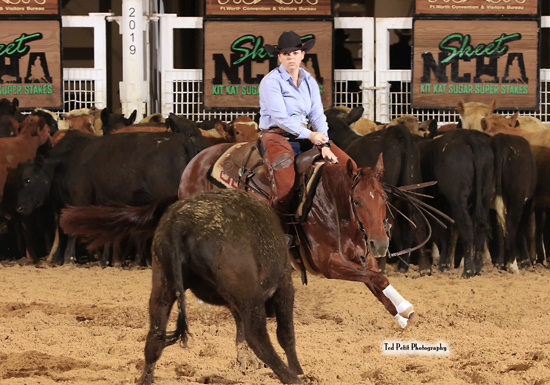 Both Cool N Hot, the 2018 NCHA Open Horse of the Year, and Donas Suen Boon were bred by Paula Wood. Bonnie Martin, the NCHA Non-Pro Hall of Fame earner of $1,013,920, came into the Super Stakes following a championship win aboard 6-year-old Reysin Kittens in the 2019 Arbuckle Mountain Classic Amateur Unlimited. Last Saturday, April 6, the Dual Rey gelding was also shown by Grant Setnicka as a finalist in the Super Stakes Classic Open Finals.